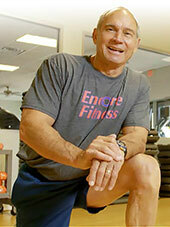 On January 7, 2013, at age 66, Edgar Schafer transformed his lifelong passion for physical fitness into a successful personal training business. His company, Encore Fitness, specializes in helping people over 50 gain strength, balance, and a lifestyle that will help them age better and more actively. Edgar understands the challenges an aging person can face, can avoid, or can overcome. He knows age brings its own hurdles. Edgar says that nine out of ten people over age 50 have an issue: bad knee, bad back, bad shoulder, something. He likes to work around those issues – finding ways to help his clients get or stay fit no matter what physical conditions they face. Part of Edgar’s success stems from his ability to motivate his clients and his staff. Motivation is key to the discipline of fitness, and, over decades of work in health insurance sales, Edgar developed a second-nature ability to read people and motivate them. Edgar has been passionate about health since his college days. When he was 19, he was invited to an exercise class, and the instructor – nearly four decades older than Edgar – wore him out. Edgar couldn’t keep up. That instructor became his mentor and showed him, among other things, the importance of sharing knowledge across generations. As Edgar’s mentor taught him, Edgar is now teaching his decades-younger workout partner while modeling a healthy lifestyle for all his clients. Edgar Schafer … Peoples Health Champion.